BROCKTON, Mass. 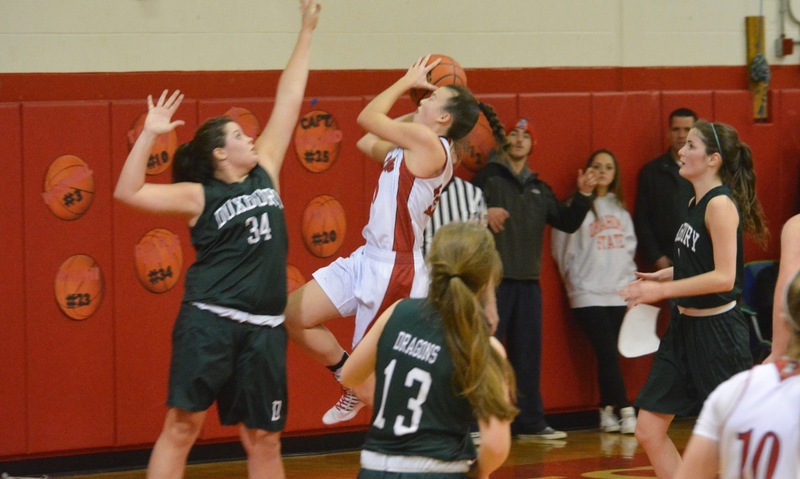 – North Attleboro won the first meeting with Foxboro this season, thanks in part to a huge fourth quarter by senior Ashley Ahern. With Ahern out injured for the second meeting, Foxboro ran over the Rocketeers and clinched the Davenport title with a 26-point victory. On Monday night at Massasoit Community College, the teams met for the third time to not only decide the season series but also to see which team would represent the Hockomock in Saturday’s Div. 2 South final. With Ahern in uniform for the introductions, but not able to play, North came in with the plan of slowing the game down, turning it into a half-court battle, playing physical defense, and trying to take advantage of its edge in size in the post. The game plan worked perfectly, but Foxboro showed that it had some grit to go along with its ability to put points on the board. 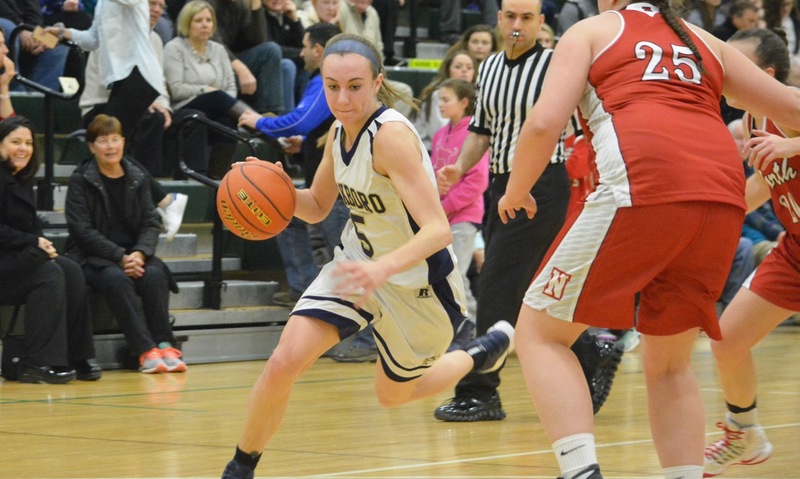 Behind a game-high 20 points from league MVP Ashley Sampson and 17 from fellow junior Lily Sykes, Foxboro defended, crashed the boards, and found just enough offense to pull out a 49-39 victory that earns the Warriors a second trip to the South final in three seasons. 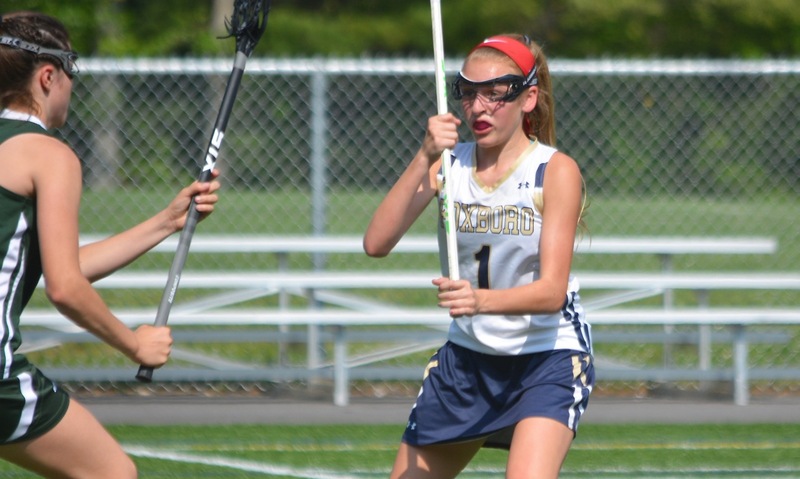 Foxboro coach Lisa Downs recognized the difficulty of playing an opponent for the third time and credited her team for finding a way to win. The first quarter was not pretty, but the Warriors had a lead and it felt like they were ready to pull away as they did on their home court three weeks ago. Sampson and Sykes split the scoring in the first, each with six points, but Foxboro lacked the typical frenetic pace that it usually plays at. North was slowing things down and shots were not falling, which made it difficult to get into the full-court press the Warriors prefer. Sykes opened the second with a drive that extended the lead to eight, but it was the only made field goal by the Warriors in the quarter. The Rocketeers climbed back into the game with Julia Feid (six points) scoring on a drive and Samantha Taggart drilling a three (her only basket of the game) to cut the lead to four. Emily Haskell gave North a big lift right before the break with a steal and a layup and then a runner on the baseline. The junior’s only four points of the game made it 20-17 at the break. In the third quarter, senior forward Caroline Collard started to get going for North, scoring six of her team-high 10 points. Liz Morehouse added three of her five points, including a turn around jumper from the left block. After Feid pulled up for a jumper and Collard scored off an Emily Schromm inbound pass, North was within one at 29-28. Foxboro was still struggling to find the range and in desperate need of a spark. 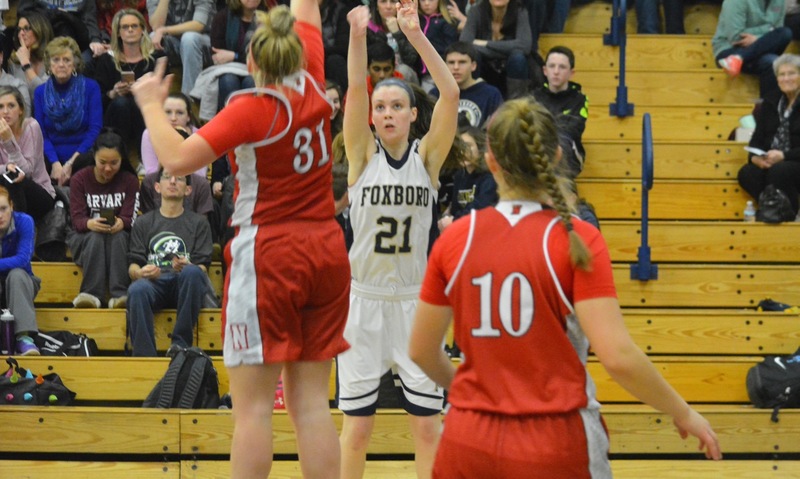 Sykes stepped up and drilled a three off a Sampson assist to extend the lead to four and then Sampson was able to beat Feid in the post for a layup to give Foxboro a six-point edge heading to the fourth. Things started to get going for Foxboro in the fourth quarter. Grace Tamulionis opened the quarter with a jumper that Feid answered with a drive, but then Sampson drove and kicked it out to Riley Collins for a straightaway three (her only point of the night) and Foxboro finally had some separation. Tamulionis had six of her seven points in the fourth and Sampson added six as well. North did not give up with Schromm knocking down a jumper and driving the length of the floor for a layup plus the foul. She missed the free throw but grabbed her own rebound with North down 44-38. The Rocketeers had only more chance to get closer but a long three by Feid was halfway down and popped out and Tamulionis clinched it with an offensive rebound and score on a missed free throw on the other end. For Sampson and the Warriors the win means a return to Brockton High where the Warriors played eventual state champion Duxbury in 2015. Sampson said, “It’s really exciting. We have an opportunity to win the South final, so it’s just really cool. Foxboro (21-2) will face No. 7 Westwood in the Div. 2 South final on Saturday at 2 p.m. at Brockton High. NORTH ATTLEBORO, Mass. – Trailing by 11 points with eight minutes remaining is a difficult hole to dig out of, particularly when you have only managed 22 points in the first 24 minutes of the game, including just five points in the third. Even facing tough odds, the experienced Rocketeers started the fourth quarter of Saturday night’s Div. 2 South quarterfinal against Duxbury in the Ken Pickering Gym believing they could win. Not only did North have its best offensive output of the night in the fourth quarter with 14 points, the Rocketeers also held Duxbury scoreless, tossing a shutout in the fourth to pull off an epic comeback and earn a 36-33 victory. The quarter started with North trailing 33-22. Caroline Collard (10 points, 11 rebounds) knocked down a jumper off a Taggart assist to get things started. North put the ball in the hands of sophomore guard Julia Feid to create and she drew a foul and made one of two at the line to cut the lead to eight points. The second free throw bounced away and was chased down by Liz Morehouse, who could not get her shot to fall. Collard snagged another offensive board and swung the ball back to Feid for a straightaway three that got the crowd starting to believe a comeback was possible with 6:07 left to play. Emily Haskell brought North within three points with a long jumper on the far side and suddenly the whole atmosphere in the building was changed. North fans were fired up and it only got louder when Taggart took the ball the length of the court for a layup that made it 33-32 inside the final two minutes. Collard grabbed her own miss, got fouled and knocked down a pair of free throws for North’s first lead since it was 10-8 in the first quarter. On the other end, Collard blocked a pair of shots, her third and fourth of the night, and grabbed the defensive board to get North back the ball. Taggart was fouled and hit both her shots from the line to make it 36-33. On Duxbury’s final possession, the Dragons continued to struggle finding a shot. Lill Foote was forced to throw up a fall away that was rebounded by Morehouse and set off raucous celebrations on the North bench. “They played some great defense, we just had to play better offense for one quarter and that’s what we did,” said Herber. Taggart added, “Our morale was really down in the third quarter because they went on a run. We talked about how we had to step it up on defense and we did exactly that. Everything just clicked together. North got off to a decent start offensively against the tall, physical Duxbury defense. Taggart scored eight of North’s 10 points in the first and the Rocketeers trailed by just two. Collard scored four points in the second and North continued to hang around, trailing by just four heading into halftime, 21-17. Things changed in the third, as Duxbury started to get into a rhythm by getting the ball inside to senior forward Nicole Callander, who scored eight of her team-high 11 points in the quarter. Meanwhile, North got a three from Feid (seven points) and a drive by Taggart. The Rocketeers were down but not out. North showed the tenacity that has allowed it to go 8-4 since an injury ended the season for senior Ashley Ahern, who was the team’s leading scorer. Herber could not contain his excitement after the game. He said, “These kids are always fighting. We’re the smallest team then we’re the team that can’t shoot then we lose Ashley and we’re down 11 to Duxbury…I’m so happy that I’m just babbling on. North Attleboro (18-6) will face top seed Foxboro in the Div. 2 South semifinal on Monday at 5:30 at Massasoit Community College. The teams split two meetings during the regular season. North Attleboro, 81 @ Sharon, 75 – Final (OT) – Click here for a recap of this game. 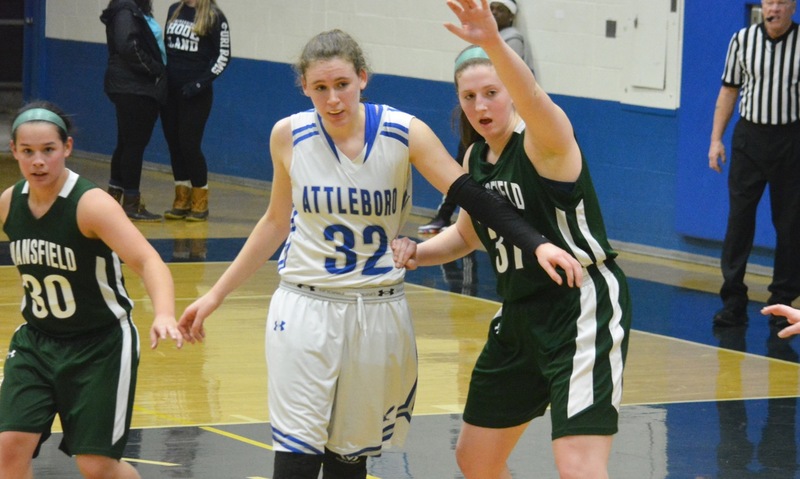 Sharon, 40 @ North Attleboro, 57 – Final – Caroline Collard scored 22 points to lead all scorers and helped North pull back into a tie with Foxboro atop the Davenport division. Samantha Taggart added 15 points for North. Sharon pulled back within 12 points in the fourth quarter and head coach Cliff Tomassian said that the Eagles played very hard throughout. Emma Eberhardt and Kaitlyn Wallace each scored 14 points in the loss.